Yttria-stabilized tetragonal zirconia polycrystal (Y-TZP) is a ceramic material that has been widely used in clinical practice owing to its attractive proven mechanical properties and biocompatibility. Since zirconia is a chemically inert material, different surface treatments can be performed to increase its bonding to resin-based cements. Air abrasion with alumina or silica-coated alumina particles is one of the most common and simple procedures used to improve micromechanical interlocking between zirconia and resin-based cements.1Attia A, Lehmann F, Kern M. Influence of surface conditioning and cleaning methods on resin bonding to zirconia ceramic. → Dent Mater. 2011 Mar;27(3):207–13.2Angkasith P, Burgess JO, Bottino MC, Lawson NC. Cleaning methods for zirconia following salivary contamination. → J Prosthodont. 2016 Jul;25(5):375–9. These particles are deposited on the surface, which differ chemically from one another, and participate in the chemical bond that occurs at the zirconia–resin cement interface.3Attia A, Lehmann F, Kern M. Influence of surface conditioning and cleaning methods on resin bonding to zirconia ceramic. → Dent Mater. 2011 Mar;27(3):207–13. The efficacy of the different air abrasion parameters (particle type, pressure, angle) on the adhesive bonding between the zirconia and resin cements have largely been evaluated,4Sarmento HR, Campos F, Sousa RS, Machado JP, Souza RO, Bottino MA, Ozcan M. Influence of air-particle deposition protocols on the surface topography and adhesion of resin cement to zirconia. → Acta Odontol Scand. 2014 Jul;72(5):346–53.5Abi-Rached FO, Martins SB, Campos JA, Fonseca RG. Evaluation of roughness, wettability, and morphology of an yttria-stabilized tetragonal zirconia polycrystal ceramic after different airborne-particle abrasion protocols. → J Prosthet Dent. 2014 Dec;112(6):1385–91.6Sciasci P, Abi-Rached FO, Adabo GL, Baldissara P, Fonseca RG. Effect of surface treatments on the shear bond strength of luting cements to Y-TZP ceramic. → J Prosthet Dent. 2015 Mar;113(3):212–9. and it is known that air abrasion is an effective method for removing salivary contamination.7Angkasith P, Burgess JO, Bottino MC, Lawson NC. Cleaning methods for zirconia following salivary contamination. → J Prosthodont. 2016 Jul;25(5):375–9. However, there is neither concern nor standardization regarding the cleaning procedure applied after air abrasion of the zirconia surface, and the cleaning methods often vary among studies. Simply dry air streaming,8Attia A, Lehmann F, Kern M. Influence of surface conditioning and cleaning methods on resin bonding to zirconia ceramic. → Dent Mater. 2011 Mar;27(3):207–13.9Baldissara P, Querzè M, Monaco C, Scotti R, Fonseca RG. Efficacy of surface treatments on the bond strength of resin cements to two brands of zirconia ceramic. → J Adhes Dent. 2013 Jun;15(3):259–67.10Ozcan M, Raadschelders J, Vallittu P, Lassilla L. Effect of particle deposition parameters on silica coating of zirconia using a chairside air-abrasion device. → J Adhes Dent. 2013 Jun;15(3):211–4. ultrasonic cleaning in distilled water11Attia A. Bond strength of three luting agents to zirconia ceramic—influence of surface treatment and thermocycling. → J Appl Oral Sci. 2011 Aug;19(4):388–95. or in some alcohols, such as isopropanol12Attia A, Lehmann F, Kern M. Influence of surface conditioning and cleaning methods on resin bonding to zirconia ceramic. → Dent Mater. 2011 Mar;27(3):207–13.13Sciasci P, Abi-Rached FO, Adabo GL, Baldissara P, Fonseca RG. Effect of surface treatments on the shear bond strength of luting cements to Y-TZP ceramic. → J Prosthet Dent. 2015 Mar;113(3):212–9. or ethanol,14Gomes AL, Castillo-Oyagüe R, Lynch CD, Montero J, Albaladejo A. Influence of sandblasting granulometry and resin cement composition on microtensile bond strength to zirconia ceramic for dental prosthetic frameworks. → J Dent. 2013 Jan;41(1):31–41. all followed by dry air streaming, are the most used cleaning methods. Two questions should be posed: whether cleaning the air-abraded surface is necessary and, if the answer is positive, if there is a method that is more effective than others. Of the few studies15Attia A, Lehmann F, Kern M. Influence of surface conditioning and cleaning methods on resin bonding to zirconia ceramic. → Dent Mater. 2011 Mar;27(3):207–13.16Nishigawa G, Maruo Y, Irie M, Oka M, Yoshihara K, Minagi S, Nagaoka N, Yoshida Y, Suzuki K. Ultrasonic cleaning of silica-coated zirconia influences bond strength between zirconia and resin luting material. → Dent Mater J. 2008 Nov;27(6):842–8.17Nishigawa G, Maruo Y, Irie M, Maeda N, Yoshihara K, Nagaoka N, Matsumoto T, Minagi S. Various effects of sandblasting of dental restorative materials. → PLoS One. 2016 Jan 14;11(1):e0147077. doi: 10.1371/journal. pone.0147077.18Attia A, Kern M. Effect of cleaning methods after reduced-pressure air abrasion on bonding to zirconia ceramic. → J Adhes Dent. 2011 Dec;13(6):561–7. that have evaluated the efficacy of the cleaning method on the resin bonding to zirconia, none of them tested an only air-abraded surface, that is, without having been air streamed even. Therefore, there is no answer to the first question. In relation to the second question, there is no consensus in the literature. Two studies19Nishigawa G, Maruo Y, Irie M, Oka M, Yoshihara K, Minagi S, Nagaoka N, Yoshida Y, Suzuki K. Ultrasonic cleaning of silica-coated zirconia influences bond strength between zirconia and resin luting material. → Dent Mater J. 2008 Nov;27(6):842–8.20Nishigawa G, Maruo Y, Irie M, Maeda N, Yoshihara K, Nagaoka N, Matsumoto T, Minagi S. Various effects of sandblasting of dental restorative materials. → PLoS One. 2016 Jan 14;11(1):e0147077. doi: 10.1371/journal. pone.0147077. reported that ultrasonic cleaning, when compared with air streaming for 5 s, decreased the bond strength,regardless of whether the ceramic was air abraded with silica-modified alumina particles21Nishigawa G, Maruo Y, Irie M, Oka M, Yoshihara K, Minagi S, Nagaoka N, Yoshida Y, Suzuki K. Ultrasonic cleaning of silica-coated zirconia influences bond strength between zirconia and resin luting material. → Dent Mater J. 2008 Nov;27(6):842–8. or simply with alumina particles.22Nishigawa G, Maruo Y, Irie M, Maeda N, Yoshihara K, Nagaoka N, Matsumoto T, Minagi S. Various effects of sandblasting of dental restorative materials. → PLoS One. 2016 Jan 14;11(1):e0147077. doi: 10.1371/journal. pone.0147077. It was argued that ultrasonic cleaning removes not only the loose particles, but also the silica layer deposited on the zirconia surface,23Nishigawa G, Maruo Y, Irie M, Oka M, Yoshihara K, Minagi S, Nagaoka N, Yoshida Y, Suzuki K. Ultrasonic cleaning of silica-coated zirconia influences bond strength between zirconia and resin luting material. → Dent Mater J. 2008 Nov;27(6):842–8. and air abrasion with alumina particles provides a highly active surface, which could easily be contaminated during the cleaning procedure,24Nishigawa G, Maruo Y, Irie M, Maeda N, Yoshihara K, Nagaoka N, Matsumoto T, Minagi S. Various effects of sandblasting of dental restorative materials. → PLoS One. 2016 Jan 14;11(1):e0147077. doi: 10.1371/journal. pone.0147077. suggesting that this procedure should be avoided. However, Attia et al. and Attia and Kern believe in the effectiveness of ultrasonic cleaning at removing the loose particles from the air-abraded surface, which could negatively affect the bond strength,25Attia A, Lehmann F, Kern M. Influence of surface conditioning and cleaning methods on resin bonding to zirconia ceramic. → Dent Mater. 2011 Mar;27(3):207–13.26Attia A, Kern M. Effect of cleaning methods after reduced-pressure air abrasion on bonding to zirconia ceramic. → J Adhes Dent. 2011 Dec;13(6):561–7. although Attia et al. did not find a significant difference in bond strength between air streaming and ultrasonic cleaning for both particles.27Attia A, Lehmann F, Kern M. Influence of surface conditioning and cleaning methods on resin bonding to zirconia ceramic. → Dent Mater. 2011 Mar;27(3):207–13. Considering the lack of studies on the subject, as well as the divergence between their results, as well as the possible influence of this procedure on the adhesive bonding to zirconia, the present study aimed to investigate whether cleaning is necessary and to compare the efficacy of different cleaning methods applied after air abrasion with different particles on the Y-TZP, on the shear bond strength between the zirconia and an adhesive resin cement. The null hypotheses were that it would not be necessary to clean the air-abraded zirconia surface and that there would be no difference among the cleaning methods. One hundred and twenty Y-TZP nonsintered disks (6.25 mm in diameter and 2.50 mm thick; Lava, 3M ESPE) were prepared. The bond surface was manually and standardly polished with 600- and 1,200-grit wet silicon carbide sandpaper. After the sintering process in a specific oven (inFire HTC speed, Sirona Dental Systems), following the manufacturer’s instructions, half of the zirconia disks (5 mm in diameter and 2 mm in thickness) were air abraded with 110 μm aluminum oxide (Al2O3) particles, while the remaining half were air abraded with 110 μm silica-modified Al2O3 particles (Rocatec Plus, 3M ESPE). For standardized air abrasion, the disks were mounted in a custom-made device. This step was performed for 15 s in an air abrasion unit (Basic classic, Renfert) at 0.28 MPa air pressure, at a 90° angle and 10 mm from the specimen surface. 5. ultrasonic cleaning in 99% isopropanol for 10 min, followed by dry air streaming for 15 s.
The composite resin disks (Filtek Z350 XT, 3M ESPE) were produced in equal amounts and with the dimensions of the zirconia disks similar to the methods used in a previous study.28Sciasci P, Abi-Rached FO, Adabo GL, Baldissara P, Fonseca RG. Effect of surface treatments on the shear bond strength of luting cements to Y-TZP ceramic. → J Prosthet Dent. 2015 Mar;113(3):212–9. To bond the composite resin disk to the zirconia disk, the latter was accurately placed into a custom-made alignment apparatus with the air-abraded surface facing upward. Prior to this, the zirconia disks were treated with CLEARFIL SE BOND PRIMER/CLEARFIL PORCELAIN BOND ACTIVATOR (both Kuraray Noritake Dental), and the proportion of 0.010 g of paste of the PANAVIA F 2.0 dual-cured resin cement (Kuraray Noritake Dental) was mixed and placed onto the resin disk, which was positioned over the zirconia surface. After the excess cement had been removed, the cementation line was light-cured in 3 different positions (120°, 240° and 360°) for a total of 120 s (40 s per side), and load of 1,000 g was applied to the resin–zirconia disks for 5 min. The specimens were stored in distilled water at 37°C for 24 h prior to the shear bond strength (SBS) test. A custom-made special holder device, developed based on the study by Fawzy and El-Askary,29Fawzy AS, El-Askary FS. Effect acidic and alkaline/ heat treatments on the bond strength of different luting cements to commercially pure titanium. → J Dent. 2009 Apr;37(4):255–63. for SBS testing was attached to a universal mechanical testing machine (EMIC Equipment and Systems Testing) equipped with a 1 kN load cell. The bonded disks were positioned in the holder device and tested for SBS, subjected to a uniaxial tensile force at the adhesive interface at a constant crosshead speed of 0.5 mm/min until failure. SBS values were recorded in MPa. Statistical analysis was performed by 2-way analysis of variance (ANOVA) and Tukey’s HSD post hoc test (α = 0.05). 5. adhesive at the zirconia–resin cement interface. The bonded surface was divided into 4 quadrants, and depending on the predominant mode of failure, the bonded surface was classified when 1 of these modes predominated in 3 or more of the 4 quadrants. For the scanning electron microscopy (SEM) analysis, 1 additional specimen from each group was obtained. The specimens were mounted on metallic stubs and analyzed under a high-resolution field emission scanning electron microscope (model JSM-7500F, JEOL), which operated at ×200 magnification with an accelerating voltage of 5 kV. The results of the 2-way ANOVA test indicate that the difference between the groups regarding the 2 particles used for the air abrasion was statistically significant (P < 0.01; Table 1). Table 2 shows the mean SBS values, standard deviations and statistical analysis results for each group. All the groups air abraded with 110 μm Al2O3 particles exhibited a significantly higher SBS than the groups treated with Rocatec Plus. The highest SBS was found in the control group (110 μm Al2O3 particles), while the lowest SBS was presented by the group cleaned with air and water spraying, followed by dry air streaming after air abrasion with Rocatec Plus. Regardless of the different cleaning methods used, the SBS within the groups air-abraded with Rocatec Plus showed no significant difference (P > 0.05). A similar result was obtained in the groups air abraded with 110 μm Al2O3 particles. The failure mode observed was 20% mixed failure and 80% adhesive at the zirconia–resin cement interface failure in the group air abraded with 110 μm Al2O3 particles, and 44.4% mixed failure and 55.6% adhesive at the zirconia–resin cement interface failure in the group for which Rocatec Plus was used (Fig. 1). SEM images of the zirconia bonding surfaces treated with different particles and cleaning methods are shown in Figure 2. Although it is not possible to identify particles from air abrasion, and thus which cleaning method was most effective, all the groups air abraded with Rocatec Plus seem slightly rougher than the ones treated with 110 μm Al2O3 particles. In the present study, 2 questions were posed regarding whether cleaning the air-abraded surface is necessary, using an only air-abraded zirconia surface as a control group, and whether there is difference in efficacy among the cleaning methods. The null hypotheses of the present study were confirmed since, regardless of the particle used, it was not necessary to clean the air-abraded surface and there was no significant difference among the different cleaning methods. In the literature, few studies were found that evaluated the efficacy of the methods of cleaning of the air-abraded zirconia surface on its bond strength to resin-based materials.30Attia A, Lehmann F, Kern M. Influence of surface conditioning and cleaning methods on resin bonding to zirconia ceramic. → Dent Mater. 2011 Mar;27(3):207–13. 31Nishigawa G, Maruo Y, Irie M, Oka M, Yoshihara K, Minagi S, Nagaoka N, Yoshida Y, Suzuki K. Ultrasonic cleaning of silica-coated zirconia influences bond strength between zirconia and resin luting material. → Dent Mater J. 2008 Nov;27(6):842–8. 32Nishigawa G, Maruo Y, Irie M, Maeda N, Yoshihara K, Nagaoka N, Matsumoto T, Minagi S. Various effects of sandblasting of dental restorative materials. → PLoS One. 2016 Jan 14;11(1):e0147077. doi: 10.1371/journal. pone.0147077. 33Attia A, Kern M. Effect of cleaning methods after reduced-pressure air abrasion on bonding to zirconia ceramic. → J Adhes Dent. 2011 Dec;13(6):561–7. Furthermore, since none of these studies34Attia A, Lehmann F, Kern M. Influence of surface conditioning and cleaning methods on resin bonding to zirconia ceramic. → Dent Mater. 2011 Mar;27(3):207–13. 35Nishigawa G, Maruo Y, Irie M, Oka M, Yoshihara K, Minagi S, Nagaoka N, Yoshida Y, Suzuki K. Ultrasonic cleaning of silica-coated zirconia influences bond strength between zirconia and resin luting material. → Dent Mater J. 2008 Nov;27(6):842–8. 36Nishigawa G, Maruo Y, Irie M, Maeda N, Yoshihara K, Nagaoka N, Matsumoto T, Minagi S. Various effects of sandblasting of dental restorative materials. → PLoS One. 2016 Jan 14;11(1):e0147077. doi: 10.1371/journal. pone.0147077. 37Attia A, Kern M. Effect of cleaning methods after reduced-pressure air abrasion on bonding to zirconia ceramic. → J Adhes Dent. 2011 Dec;13(6):561–7. used an only air-abraded zirconia surface as a control group, even without air streaming, up to now, the necessity of cleaning had not been definitively determined. In the current study, the SBS results indicated that cleaning was not necessary, regardless of the particle used for air abrasion. However, for both alumina and silica-coated alumina particles, some differences in the failure pattern among the groups were detected, which could guide us regarding how to better proceed after air abrasion. For the Al2O3 particles, the group cleaned with air and water spraying and then dry air streaming exhibited the highest percentage of adhesive failure (100%), followed by the control group and the group cleaned with ultrasonic cleaning in water and then dry air streaming (89%). In the literature, no studies were found that evaluated the effects of either air and water spraying followed by dry air streaming or the absence of any treatment after air abrasion, that is, the control group in the present study, on the resin bonding to zirconia. However, we suppose that the high percentage of adhesive failure of the control group may be attributed to the particles that were weakly adhered to the air-abraded surface. The importance of removing loose particles not firmly attached to the ceramic surface after air abrasion by ultrasonic cleaning prior to bonding has been already reported.38Kern M. Resin bonding to oxide ceramics for dental restorations. → J Adhes Sci Technol. 2009;23(7–8):1097–111. Additionally, Attia et al. and Attia and Kern believe in the effectiveness of ultrasonic cleaning at removing the loose particles from the air-abraded surface, which could negatively affect the bond strength,39Attia A, Lehmann F, Kern M. Influence of surface conditioning and cleaning methods on resin bonding to zirconia ceramic. → Dent Mater. 2011 Mar;27(3):207–13. 40Attia A, Kern M. Effect of cleaning methods after reduced-pressure air abrasion on bonding to zirconia ceramic. → J Adhes Dent. 2011 Dec;13(6):561–7. although Attia et al. did not find a significant difference in the bond strength between air streaming and ultrasonic cleaning for both particles.41Attia A, Lehmann F, Kern M. Influence of surface conditioning and cleaning methods on resin bonding to zirconia ceramic. → Dent Mater. 2011 Mar;27(3):207–13. Table 1: Two-way analysis of variance. †SS = Sum of squares. Table 2: Mean shear bond strength values and standard deviations (MPa) and statistical results. Different uppercase letters indicate significant differences in columns (P < 0.05). Different lowercase letters indicate significant differences in rows (P < 0.05). However, Nishigawa et al. observed that ultrasonic cleaning in distilled water (5 min) followed by air streaming (240 min) after air abrasion with Al2O3 particles decreased the bond strength at the zirconia– resin cement interface when compared with only air streaming for 5 s, from which they concluded that ultrasonic cleaning should be avoided after air abrasion.42Nishigawa G, Maruo Y, Irie M, Maeda N, Yoshihara K, Nagaoka N, Matsumoto T, Minagi S. Various effects of sandblasting of dental restorative materials. → PLoS One. 2016 Jan 14;11(1):e0147077. doi: 10.1371/journal. pone.0147077. According to these authors, air abrasion with Al2O3 particles provides a surface layer high in purity and activity, which presents with high chemical affinity to react with chemical compounds; therefore, they raise the possibility that the highly active zirconia surface may have been contaminated during the ultrasonic cleaning procedure. Still regarding the failure modes in the present study, the groups cleaned with dry air streaming only and with ultrasonic cleaning in isopropanol followed by dry air streaming presented 33% and 45% mixed failure, respectively, for the Al2O3 particles. Attia et al. also observed no significant difference between ultrasonic cleaning by air streaming and in isopropanol after the zirconia had been air abraded with 110 μm Al2O3 particles, both groups having shown cohesive failure within the luting resin and the composite.43Attia A, Lehmann F, Kern M. Influence of surface conditioning and cleaning methods on resin bonding to zirconia ceramic. → Dent Mater. 2011 Mar;27(3):207–13. Based on all these findings, among the cleaning methods tested in the present study, air streaming only, which is a more practical technique than ultrasonic cleaning in isopropanol followed by dry air streaming, could be an appropriate choice. Regarding the 110 μm silica-modified Al2O3 particles (Rocatec Plus), in the present study, as occurred with the Al2O3 particles, no statistical difference in the SBS was observed among the cleaning methods, but there were some subtle differences in the failure mode pattern. Again, only adhesive and mixed failures were observed, the control group and the group cleaned with ultrasonic cleaning in distilled water followed by dry air streaming having the highest percentages of mixed failure, 55.6% for both. In contrast, different from what was observed in the present study, Nishigawa et al. observed a lower mean SBS value and 100% adhesive failure when the silica-coated zirconia surface (Rocatec Plus) was ultrasonically cleaned in distilled water for 1 min (8.1 MPa) or 5 min (7.2 MPa), than when it was cleaned with air streaming (9.6 MPa), which exhibited a higher percentage of cohesive failure (50%).44Nishigawa G, Maruo Y, Irie M, Oka M, Yoshihara K, Minagi S, Nagaoka N, Yoshida Y, Suzuki K. Ultrasonic cleaning of silica-coated zirconia influences bond strength between zirconia and resin luting material. → Dent Mater J. 2008 Nov;27(6):842–8. According to these authors, this behavior could be explained by the silica on the surface easily being removed by ultrasonic cleaning, and consequently, it was concluded that this cleaning procedure should be avoided after silica coating.45Nishigawa G, Maruo Y, Irie M, Oka M, Yoshihara K, Minagi S, Nagaoka N, Yoshida Y, Suzuki K. Ultrasonic cleaning of silica-coated zirconia influences bond strength between zirconia and resin luting material. → Dent Mater J. 2008 Nov;27(6):842–8. Different from our study, in which air streaming was used to dry the wet zirconia surface after an ultrasonic bath, these authors46Nishigawa G, Maruo Y, Irie M, Oka M, Yoshihara K, Minagi S, Nagaoka N, Yoshida Y, Suzuki K. Ultrasonic cleaning of silica-coated zirconia influences bond strength between zirconia and resin luting material. → Dent Mater J. 2008 Nov;27(6):842–8. left the surface to air-dry for 60 min. Maybe this drying method was insufficient to remove all of the moisture from the silica-coated surface, impairing adhesion and explaining the lower mean SBS values. Moreover, in our study, ultrasonic cleaning in distilled water (9.4 MPa), which was performed for a longer time (10 min) than used by Nishigawa et al. 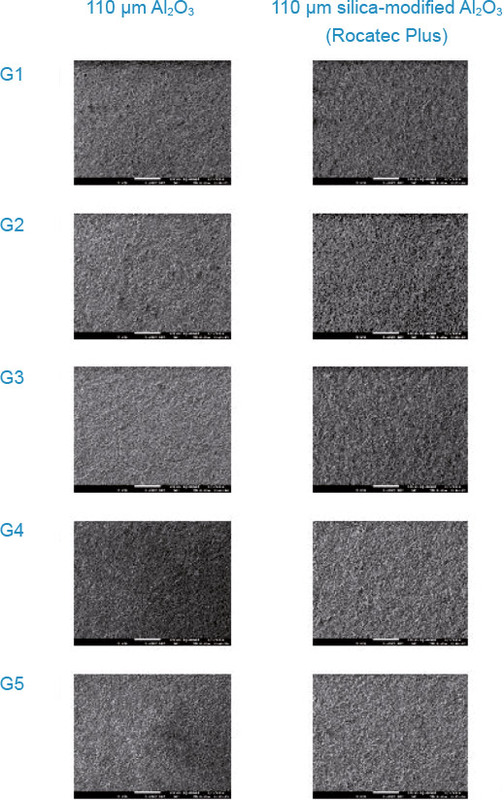 (1 or 5 min),47Nishigawa G, Maruo Y, Irie M, Oka M, Yoshihara K, Minagi S, Nagaoka N, Yoshida Y, Suzuki K. Ultrasonic cleaning of silica-coated zirconia influences bond strength between zirconia and resin luting material. → Dent Mater J. 2008 Nov;27(6):842–8. as well as our control group (10.5 MPa), provided mean SBS values similar to those of the best group reported by those authors (9.6 MPa).48Nishigawa G, Maruo Y, Irie M, Oka M, Yoshihara K, Minagi S, Nagaoka N, Yoshida Y, Suzuki K. Ultrasonic cleaning of silica-coated zirconia influences bond strength between zirconia and resin luting material. → Dent Mater J. 2008 Nov;27(6):842–8. Besides that, in the present study, the group cleaned with air streaming only yielded higher mean SBS values (11.6 MPa), but a lower (33%) percentage of mixed failure. Based on these findings regarding the mean SBS values and the failure mode patterns for the groups treated with 110 μm silica-modified Al2O3 particles (Rocatec Plus), we believe that the most efficient and most practical procedure for treating the silica-coated surface is simply not to clean it after silica coating. Although the comparison between both 110 μm particles was not the main purpose of the present study, the significant superiority in SBS of the Al2O3 particles over the silica-modified ones, regardless of the cleaning method, must be discussed. The SEM images showed that all of the groups air abraded with Rocatec Plus seemed slightly rougher than the ones treated with Al2O3 particles, although the latter obtained higher SBS values. It indicates that particles with the same size, but with chemical differences in their surfaces may behave differently toward the material applied afterward. In this case, the materials used were the CLEARFIL SE BOND PRIMER/CLEARFIL PORCELAIN BOND ACTIVATOR and PANAVIA F 2.0. Considering that Al2O3 is an adsorbent for phosphoric acid and that these materials contain MDP, which is a phosphate monomer, coating the zirconia surface with alumina particles contributes to improving the bond strength at the zirconia–resin cement interface.49Nishigawa G, Maruo Y, Irie M, Maeda N, Yoshihara K, Nagaoka N, Matsumoto T, Minagi S. Various effects of sandblasting of dental restorative materials. → PLoS One. 2016 Jan 14;11(1):e0147077. doi: 10.1371/journal. pone.0147077. The high affinity of the MDP phosphate monomer present in this resin cement to Al2O3 particles achieves high and durable bond strength values, which has already been evidenced in some studies.50Wolfart M, Lehmann F, Wolfart S, Kern M. Durability of the resin bond strength to zirconia ceramic after using different surface conditioning methods. → Dent Mater. 2007 Jan;23(1):45–50. 51Hummel M, Kern M. Durability of the resin bond strength to the alumina ceramic Procera. → Dent Mater. 2004 Jun;20(5):498–508. 52Wegner SM, Kern M. Long-term resin bond strength to zirconia ceramic. → J Adhes Dent. 2000 Summer;2(2):139–42. 53Kern M, Wegner SM. Bonding to zirconia ceramic: adhesion methods and their durability. → Dent Mater. 1998 Jan;14(1):64–71. Moreover, Fonseca et al. showed that the association between Al2O3 particles and the MDP phosphate monomer is stronger than the association between this monomer and a silica-coated surface.54Fonseca RG, Martins SB, de Oliveira Abi-Rached F, Dos Santos Cruz CA. Effect of different airborne-particle abrasion/bonding agent combinations on the bond strength of a resin cement to a base metal alloy. → J Prosthet Dent. 2012 Nov;108(5):316–23. Nothdurft et al. reported that, with the use of the Rocatec system, a partially significant increase in SBS could be achieved with cements that do not contain phosphate monomer in comparison with those that contain this monomer.55Nothdurft FP, Motter PJ, Pospiech PR. Effect of surface treatment on the initial bond strength of different luting cements to zirconium oxide ceramic. 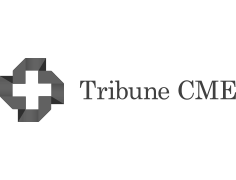 → Clin Oral Investig. 2009 Jun;13(2):229–35. Also, some studies56Chen C, Kleverlaan CJ, Feilzer AJ. Effect of an experimental zirconia-silica coating technique on micro tensile bond strength of zirconia in different priming conditions. → Dent Mater. 2012 Aug;28(8):e127–34. doi: 10.1016/j.dental. 2012.04.020. 57Qeblawi DM, Muñoz CA, Brewer JD, Monaco EA Jr. The effect of zirconia surface treatment on flexural strength and shear bond strength to a resin cement. → J Prosthet Dent. 2010 Apr;103(4):210–20. showed that the association between a silica-coated surface and the MDP phosphate monomer is not as strong as the association between that surface and the silane. These findings indicate that the chemical affinity between Al2O3 particles and the MDP phosphate monomer is higher than that between this monomer and silica-modified Al2O3 particles. Based on this, the superiority of the Al2O3 particles over the silicamodified ones was already expected. However, regarding the failure pattern resultant from the Al2O3 particles and the silica-modified ones in the present study, the silica-coated groups tended to present more mixed failures. This finding leads us to reflect on the actual significance of the bond strength values obtained for the silica-coated groups, which partially reveal the cohesive strength of the resin cement, which, in some cases, was lower than the adhesive bonding of the zirconia–resin cement interface. It is still not clear in the literature whether there is a chemical affinity between phosphoric acid groups, such as the MDP phosphate monomer with silica particles. Further research is necessary to clarify this aspect. 1. Regardless of the particle used, the cleaning method did not influence the zirconia–resin cement bond strength; thus, it was not necessary to clean the air-abraded surface. 2. The particle type applied by the air abrasion influenced the zirconia adhesive bond strength more than the cleaning method did. Fig. 1 – Failure mode. G1: no cleaning (control); G2: dry air streaming for 15 s; G3: air and distilled water spraying for 15 s, followed by dry air streaming for 15 s; G4: ultrasonic cleaning in distilled water for 10 min, followed by dry air streaming for 15 s; G5: ultrasonic cleaning in 99% isopropanol for 10 min, followed by dry air streaming for 15 s.
Fig. 2 – SEM images of the zirconia bonding surfaces treated with different particles and cleaning methods. 1, 3, 8, 12, 15, 25, 27, 30, 34, 39, 41, 43. ↑ Attia A, Lehmann F, Kern M. Influence of surface conditioning and cleaning methods on resin bonding to zirconia ceramic. → Dent Mater. 2011 Mar;27(3):207–13. 2, 7. ↑ Angkasith P, Burgess JO, Bottino MC, Lawson NC. Cleaning methods for zirconia following salivary contamination. → J Prosthodont. 2016 Jul;25(5):375–9. 4. ↑ Sarmento HR, Campos F, Sousa RS, Machado JP, Souza RO, Bottino MA, Ozcan M. Influence of air-particle deposition protocols on the surface topography and adhesion of resin cement to zirconia. → Acta Odontol Scand. 2014 Jul;72(5):346–53. 5. ↑ Abi-Rached FO, Martins SB, Campos JA, Fonseca RG. Evaluation of roughness, wettability, and morphology of an yttria-stabilized tetragonal zirconia polycrystal ceramic after different airborne-particle abrasion protocols. → J Prosthet Dent. 2014 Dec;112(6):1385–91. 6, 13, 28. ↑ Sciasci P, Abi-Rached FO, Adabo GL, Baldissara P, Fonseca RG. Effect of surface treatments on the shear bond strength of luting cements to Y-TZP ceramic. → J Prosthet Dent. 2015 Mar;113(3):212–9. 9. ↑ Baldissara P, Querzè M, Monaco C, Scotti R, Fonseca RG. Efficacy of surface treatments on the bond strength of resin cements to two brands of zirconia ceramic. → J Adhes Dent. 2013 Jun;15(3):259–67. 10. ↑ Ozcan M, Raadschelders J, Vallittu P, Lassilla L. Effect of particle deposition parameters on silica coating of zirconia using a chairside air-abrasion device. → J Adhes Dent. 2013 Jun;15(3):211–4. 11. ↑ Attia A. Bond strength of three luting agents to zirconia ceramic—influence of surface treatment and thermocycling. → J Appl Oral Sci. 2011 Aug;19(4):388–95. 14. ↑ Gomes AL, Castillo-Oyagüe R, Lynch CD, Montero J, Albaladejo A. Influence of sandblasting granulometry and resin cement composition on microtensile bond strength to zirconia ceramic for dental prosthetic frameworks. → J Dent. 2013 Jan;41(1):31–41. 16, 19, 21, 23, 31, 35, 44, 45, 46, 47, 48. ↑ Nishigawa G, Maruo Y, Irie M, Oka M, Yoshihara K, Minagi S, Nagaoka N, Yoshida Y, Suzuki K. Ultrasonic cleaning of silica-coated zirconia influences bond strength between zirconia and resin luting material. → Dent Mater J. 2008 Nov;27(6):842–8. 17, 20, 22, 24, 32, 36, 42, 49. 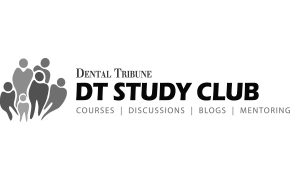 ↑ Nishigawa G, Maruo Y, Irie M, Maeda N, Yoshihara K, Nagaoka N, Matsumoto T, Minagi S. Various effects of sandblasting of dental restorative materials. → PLoS One. 2016 Jan 14;11(1):e0147077. doi: 10.1371/journal. pone.0147077. 18, 26, 33, 37, 40. ↑ Attia A, Kern M. Effect of cleaning methods after reduced-pressure air abrasion on bonding to zirconia ceramic. → J Adhes Dent. 2011 Dec;13(6):561–7. 29. ↑ Fawzy AS, El-Askary FS. Effect acidic and alkaline/ heat treatments on the bond strength of different luting cements to commercially pure titanium. → J Dent. 2009 Apr;37(4):255–63. 38. ↑ Kern M. Resin bonding to oxide ceramics for dental restorations. → J Adhes Sci Technol. 2009;23(7–8):1097–111. 50. 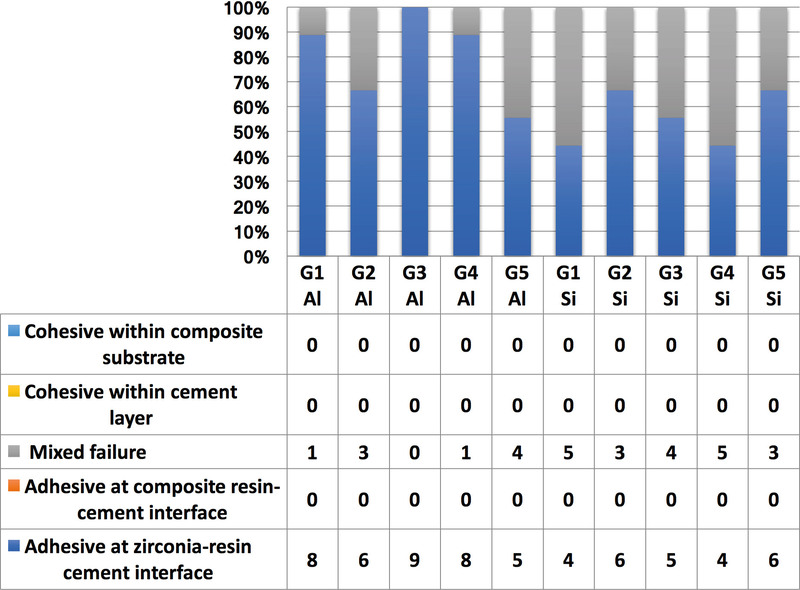 ↑ Wolfart M, Lehmann F, Wolfart S, Kern M. Durability of the resin bond strength to zirconia ceramic after using different surface conditioning methods. → Dent Mater. 2007 Jan;23(1):45–50. 51. ↑ Hummel M, Kern M. Durability of the resin bond strength to the alumina ceramic Procera. → Dent Mater. 2004 Jun;20(5):498–508. 52. ↑ Wegner SM, Kern M. Long-term resin bond strength to zirconia ceramic. → J Adhes Dent. 2000 Summer;2(2):139–42. 53. ↑ Kern M, Wegner SM. Bonding to zirconia ceramic: adhesion methods and their durability. → Dent Mater. 1998 Jan;14(1):64–71. 54. ↑ Fonseca RG, Martins SB, de Oliveira Abi-Rached F, Dos Santos Cruz CA. Effect of different airborne-particle abrasion/bonding agent combinations on the bond strength of a resin cement to a base metal alloy. → J Prosthet Dent. 2012 Nov;108(5):316–23. 55. ↑ Nothdurft FP, Motter PJ, Pospiech PR. Effect of surface treatment on the initial bond strength of different luting cements to zirconium oxide ceramic. → Clin Oral Investig. 2009 Jun;13(2):229–35. 56. ↑ Chen C, Kleverlaan CJ, Feilzer AJ. Effect of an experimental zirconia-silica coating technique on micro tensile bond strength of zirconia in different priming conditions. → Dent Mater. 2012 Aug;28(8):e127–34. doi: 10.1016/j.dental. 2012.04.020. 57. ↑ Qeblawi DM, Muñoz CA, Brewer JD, Monaco EA Jr. The effect of zirconia surface treatment on flexural strength and shear bond strength to a resin cement. → J Prosthet Dent. 2010 Apr;103(4):210–20.